Why add yogurt to pancakes? Besides the fact that it makes the pancakes very light and fluffy it's also a great way to sneak some extra nutrition into your morning meal. Why Stonyfield yogurt? How about the fact that all of their products are organic, and their yogurt contain 6 live active cultures where most others only have 2-4. You can get more faqs about them here....but right now let's talk fall pancakes. 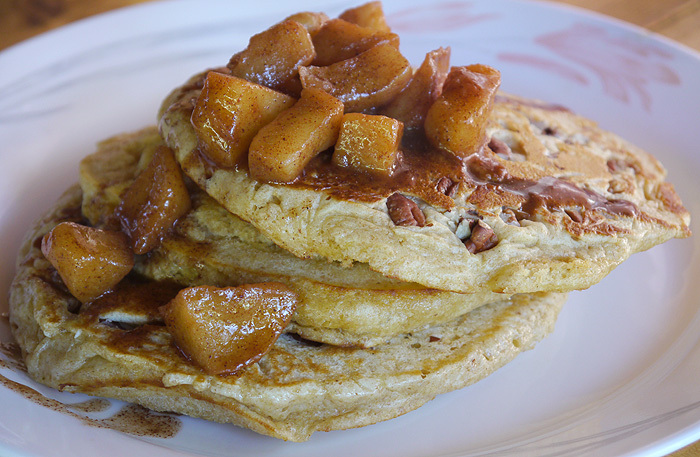 When it comes to food nothing screams fall to me more than cinnamon and apples; which is why I decided to do Cinnamon Pecan Pancakes with Spiced Apple Compote. These pancakes were super moist and so tasty that no additional syrup or butter was needed, at least in my opinion. Try them for yourself and let me know your thoughts. In a bowl mix flours, sugar, baking powder and salt. In a separate bowl, whisk milk, eggs, vanilla, and yogurt. Whisk the wet into the dry ingredients just until combined. Heat a lightly oiled griddle or frying pan over medium high heat. Pour or scoop the batter onto the griddle, using approximately 1/4 cup for each pancake. Brown on both sides and serve hot topped with apple compote. Melt butter in a saute pan over medium heat. Add the apples and spices and cook at a gentle simmer until the apples are tender and the liquid has reduced to a syrup-like consistency. Remove cloves before serving. Would love to be somewhere cold, sitting fireside and eating your fantastic fall pancakes! Yum! Could not reply as 30AEATS for some reason? Fall on a plate - yum! Also, I keep forgetting to tell you I love the new look of your blog. This is such a classic pairing - spices and apples warm the soul! Thanks for joining me in this fun virtual party! I love to make muffins with yogurt. I need to add pecans to my pancakes ... would love the crunch! Stonyfield is my favorite favorite yogurt! Um, could you come to my house and make pancakes for me? Tomorrow would be good. Wake me up when they're done. Solomon best Diabetic Care Products Diabetic Care Products avaliable with international range of alternate therapies with high amdf gauranted effeciency online with free home delivery. I make have a great blueberry waffle recipe that uses greek yogurt. The yogurt makes them so moist. Few days ago I baked pears pancakes and it's taste as yours. I also used yogurt too and it's fantastic.